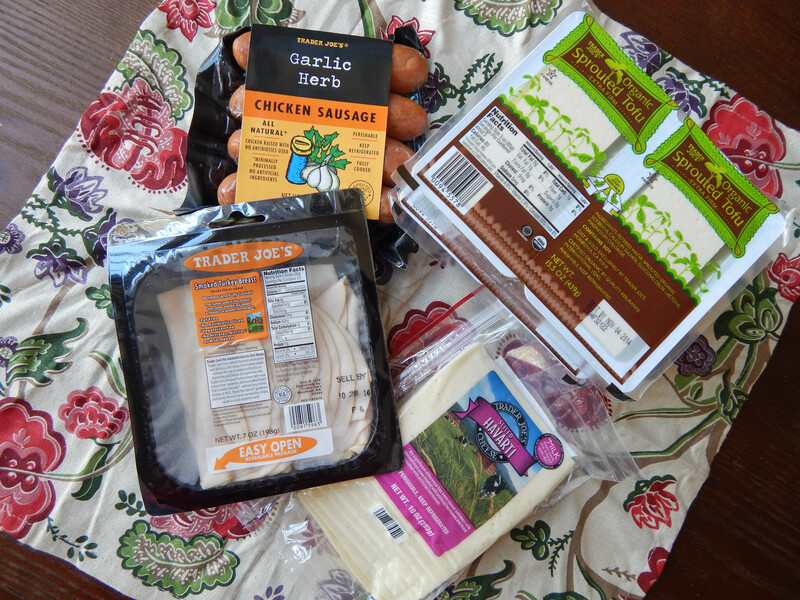 I usually don’t go to Trader Joe’s more than once a month (sometimes less than that), but I have been liking it more and more lately. It is becoming one of my favorite grocery stores. The variety of products they offer is great because you find some really unique items. Let’s get started with drinks. I bought my favorite vanilla unsweetened almond milk. I wish I had picked up two, because we have already gone through a lot of it in 2 days. We stocked up on juice, because I have already told you guys how much we like their juices. My husband picked out the orange peach mango juice, and he really liked that. It is really peachy, so if you love peach this would be a good juice for you. The pineapple juice is great and only has one ingredient, pineapples. I liked their bottled unsweetened blueberry pom green tea the last time I tried it and decided to try the plain green tea as well this time. We also got beer! 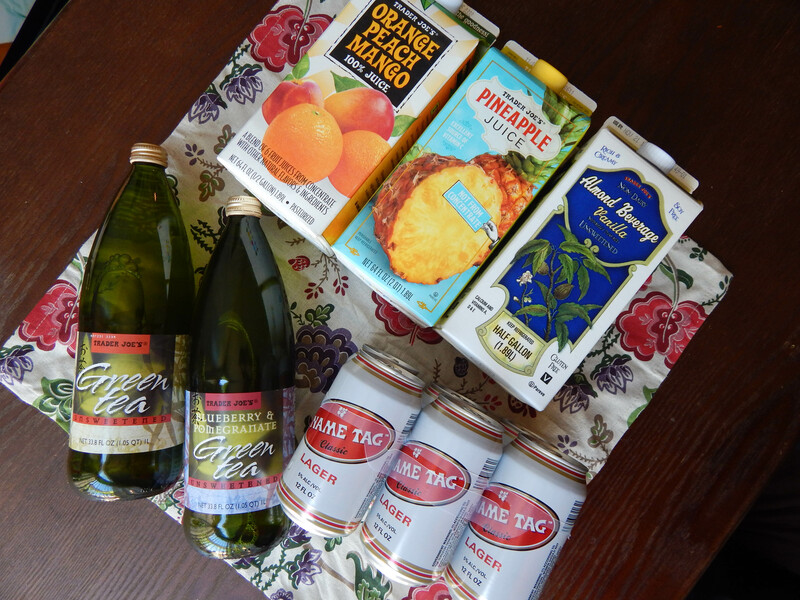 They have a cool selection of beer at Trader Joe’s, and this time Tommy decided to try one. He picked the Trader Joe’s brand Name Tag Lager. The 6-pack was only $3.99. We tried one out, and both liked it. It is a good light tasting beer. Husband approved. At the sample section they had an amazing turkey pesto panini, and we got suckered into buying everything to make them at home. The smoked turkey and Havarti cheese are specifically for those. Tommy picked another chicken sausage, this time Garlic Herb flavor. I have been on a tofu kick lately too, so I picked up more tofu. If I can make my steak loving husband love tofu, I think I am doing a pretty good job cooking it, right? 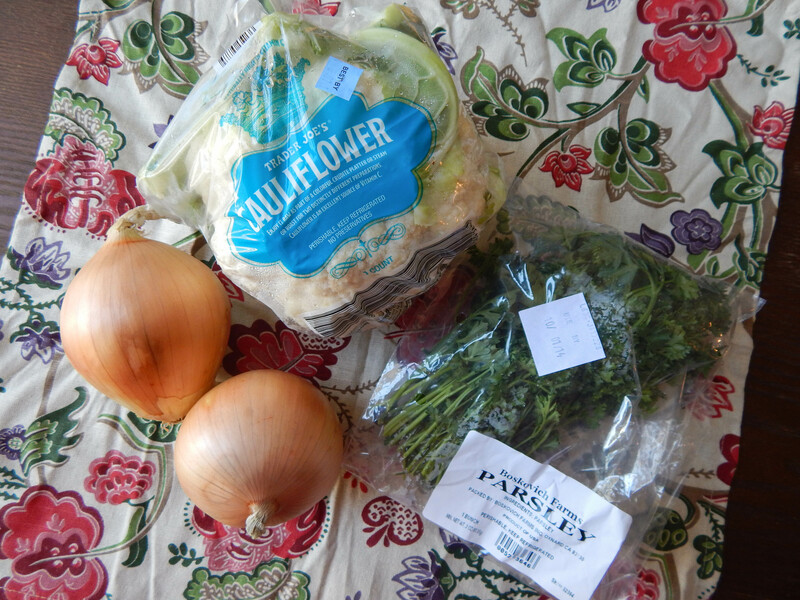 I only picked up a couple of veggies here: some onions, cauliflower and some parsley. 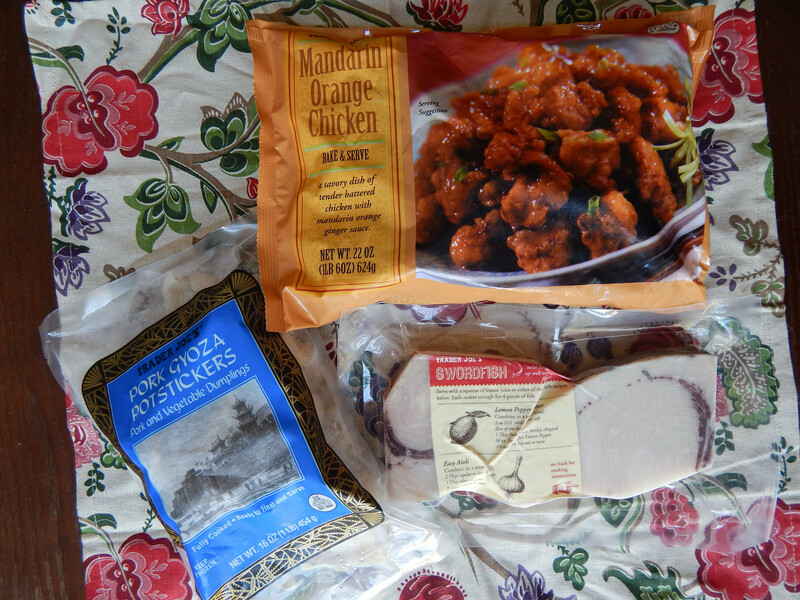 From the frozen food section we had to get the Mandarin Orange Chicken. It was so good last time! It was so easy and quick to make on a busy night as well. My husband picked out these Pork Gyoza Potstickers, and we also got two swordfish steaks. We love seafood, so I will definitely be thinking of a good way to cook these up. These are the pantry items I needed. The bread and pesto are for the turkey paninis. 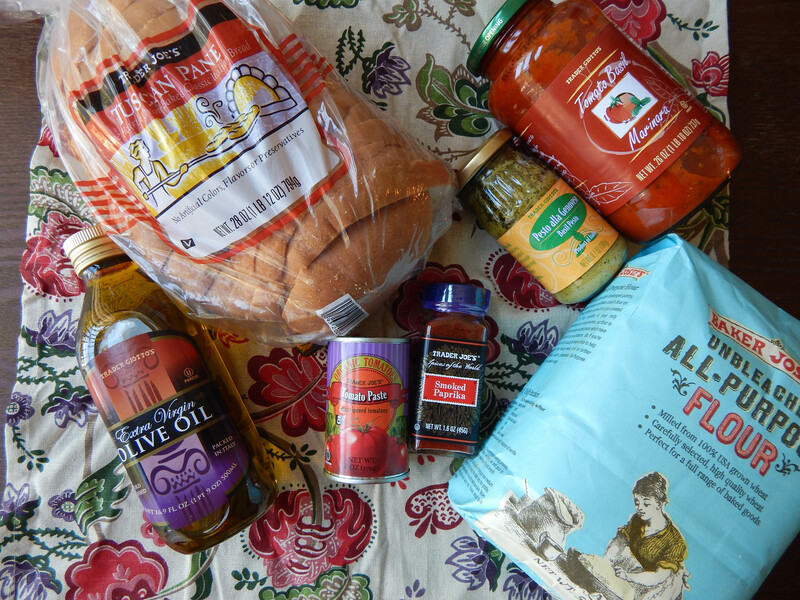 The marinara, tomato paste and olive oil are all things I needed to stock up on.The smoked paprika will be good to add to my spices, and the flour I will be using to do some baking soon. 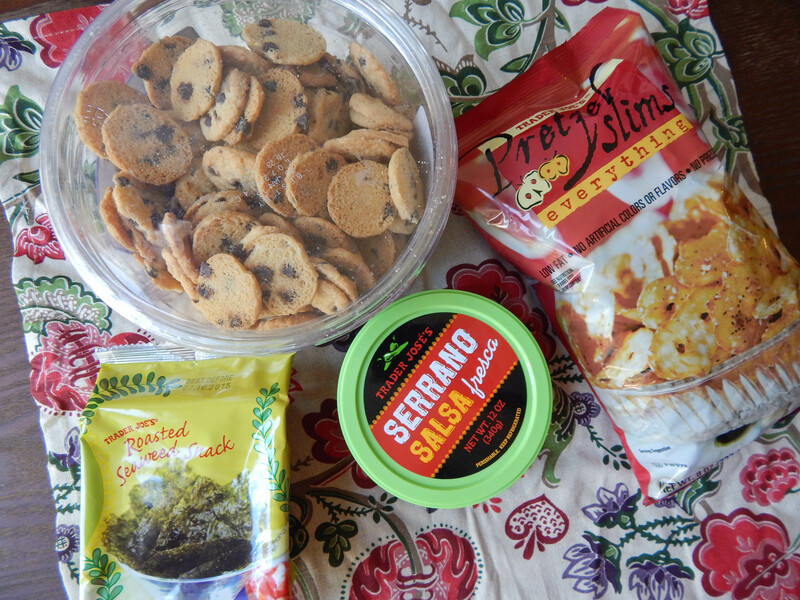 Snack foods! The crispy chocolate chip cookies are way too good. I decided to get them, because there was only one tub left on the shelf. That’s not even a logical reason, but I did it anyway. The Pretzel Slims are good for dipping into hummus or eating with tuna salad. I got the “everything,” and they had a lot of flavor. There was only one pack of roasted seaweed left, and we got that too. The Serrano Salsa Fresca is already gone after 2 days. It’s that good!